By Guen Douglas A fantastic time at the Montreal tattoo convention and a week and a half guest spot Ottawa's 5-Cents tattoo have inspired me to write about this months topic: Custom Tattoos: The Process... I had a no-show during my guest spot at 5-Cents. 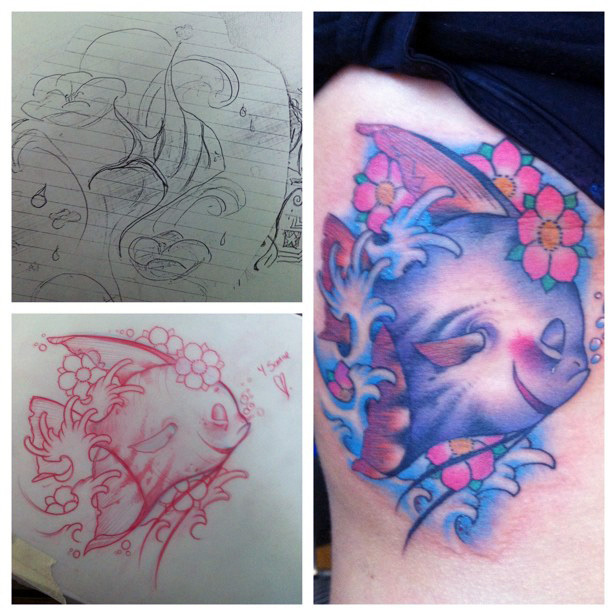 This client had been asking to get tattooed by me for a whole year (since last year's convention). We emailed back and forth. discussed her idea and she sent me photos of where she wanted it placed. We also both expressed excitement. The last time I heard from her was a week before the appointment. She sent me one final "can't wait 'til next week" e-mail. The day of the appointment rolled around and there was no sign of her, no email and she did not answer her phone or call me back to ease my worry about her being in a ditch on the highway. Not even for a moment did I think that this client wouldn't come to her appointment... To add insult to injury the joys of Facebook let me know that she was indeed alive and well, and that she got tattooed at the convention 100 meters away from where I was sitting. Not once did it occur to her to come and apologize for not showing up or offer an excuse as to why. I'm disappointed that I didn't get to do the tattoo (The drawing is super cute!! It's up for grabs if anyone wants it ha-ha.) but it cost me time (the time I spent communicating via e-mail and the time I spent drawing), and money to have that client not show up without so much as a phone call or e-mail. Especially when traveling, tattooers rely on our work to break even, it's what facilitates us being able to travel to conventions and such. Most tattooers will tell you that a "no-show" is not only disheartening but disrespectful. It occurred to me however that customers may not completely understand what our job actually entails. Maybe if they understood what goes into preparing for a custom tattoo they may be less likely to be so flippant about their appointments. When it comes to custom tattoos every artist has a slightly different process. I can only tell you how I work since no two tattooers works exactly the same. If you have any questions about your tattooer's process I'm sure they would be happy to explain. The first step in getting a custom tattoo is to choose your artist. This decision should be based on the quality and style of work displayed in their portfolio. Generally if you find a tattooer whose portfolio you like end to end you are likely to like what they draw for you. If there are only one or two pieces in a portfolio in the style that you want; it's not to say that it will be impossible to get what you are looking for but it will maybe require a more careful explanation of what you want for the artist to properly understand. Being prepared helps! Spend some time looking online or at the library. The more you have with you to describe what you are imagining, the better. I usually recommend not only looking at tattoos but at photographs of the subject matter. For example, if you are looking to get a gypsy tattoo you could bring: photos of gypsy tattoos you like and photographs of women, hair, jewelry, fabrics... The best reference a client can bring me, to describe the style of tattoo they want, are photos from my own portfolio. It helps me understand what it is they liked about my portfolio and in turn I can create something in that vein for them. That being said it is not always important to bring reference material. It depends on the type of client you are. Some clients like to give their artist freedom to explore a subject and some want to be specific about what they expect. Neither is better than the other in my opinion, but it's always nice to be able to fulfill someone's expectations. There is nothing worse than having a client bring you nothing, tell you to draw anything and then have them look at the finished drawing and say it looks nothing like they expected! If you have expectations bring examples. Tattooers are not mind-readers! We love to have freedom but not if means you won't like the drawing. In the end the tattoo is for you. Our enjoyment is secondary to you being satisfied with the finished product. 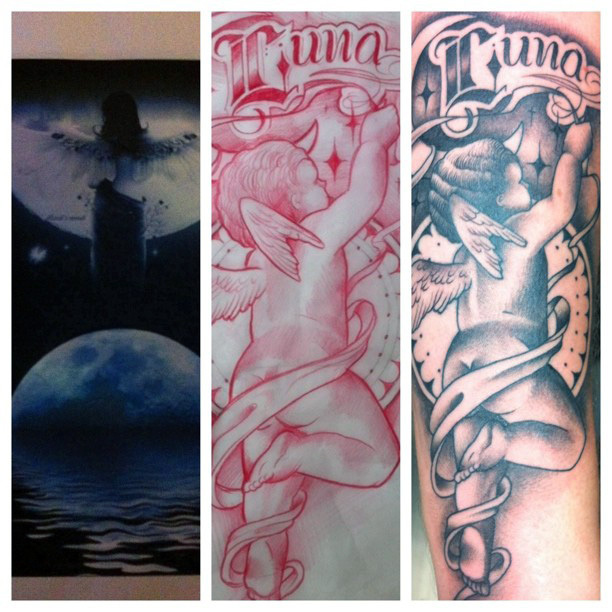 Also don't bring in a picture of someone else's custom tattoo and expect your artist to replicate it. Your tattooer will usually suggest to keep the idea and make it your own. It's better to have an original than a knock-off. It does happen that sometimes tattooers refuse work based on what a client brings in. Don't think that this is because your idea isn't a good one. Usually we refuse work because we don't think we can execute it in the way in the client wants. A good tattooer will send you to someone who he or she thinks will do a better job if they don't think it's within their skill set. Sometimes we refuse work because a client is not willing to make concessions to make it more tattooable. Most artists are not willing to do work they don't believe will look good because our reputations are attached to the work we do. Once a client has chosen me to do their tattoo I either have a consultation on then spot if I have time between clients, (and if they have their reference material with them) or I book them an appointment for a chat at a later date. At the consultation we discuss what the client expects and look through the examples they have brought. This is my opportunity to get to know my client's likes and dislikes and give my opinion about how I think the tattoo should be executed. I then usually either take a tracing of the area to be tattooed and/or a photograph. My advice to clients; be clear and concise not only about what you want, but what you don't want. I would also suggest to clients to have an open mind. These days many clients want to have tattoos laced with meaning (eg: they want a certain number of petals on a flower for family members, certain colors to describe birth months or banners with death dates). In my opinion meanings can be achieved without always being literal. A tattoo is a visual expression and often when an artist is confined by specifics like these, it can make the tattoo look awkward and forced. 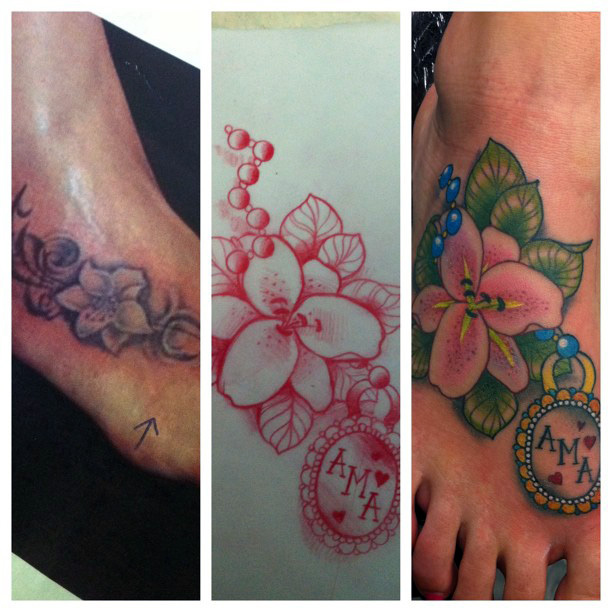 A consultation appointment is the time for client and tattooer to find solutions to the clients needs and wants. 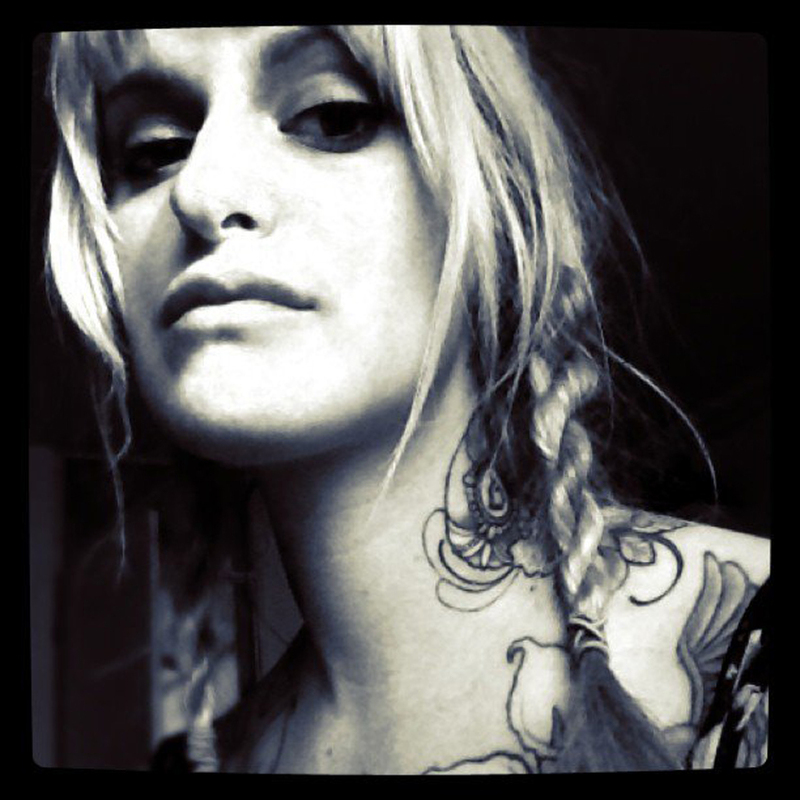 The truth is, you cannot judge how good a tattooer is based on how long their waiting list is. There are too many variables. Tattooers that specialize in large-scale work will often have longer waiting lists than tattooers that do pieces completed in one session. Some only work on one client per day and some work on many. I know plenty of fantastic tattooers that have a two-week waiting list and some that have a year-long list. All I can say about waiting is if you have found an artist that you love, it is worth waiting. Your tattoo will last a long time, so what is a few days, weeks or months in the grand scheme of things? I've seen clients come to the shop that didn't want to wait, go elsewhere only to end up with a tattoo they didn't wanted. Not every tattooer draws ahead of time. Some draw the day of, the night before, the week before, some the month before and some will draw right on you. Personally, I usually draw the week before, I have one day per week set aside for drawing and research. However, I don't show or e-mail drawings before the appointment. Some tattooers do. If it is important for you to see and make changes before your appointment this is something you should discuss with your artist before you book. My opinion is that if I've been told everything I need to know at the consultation appointment there'll only be minor changes to make the day of. I also think e-mailing is tricky. There is an opportunity for us as tattooers to be taken advantage of. Most tattooers don't charge for drawing time and when we send out a design we run the risk that a client looking for a deal will take our design and get it tattooed in their mate's kitchen. Not cool. 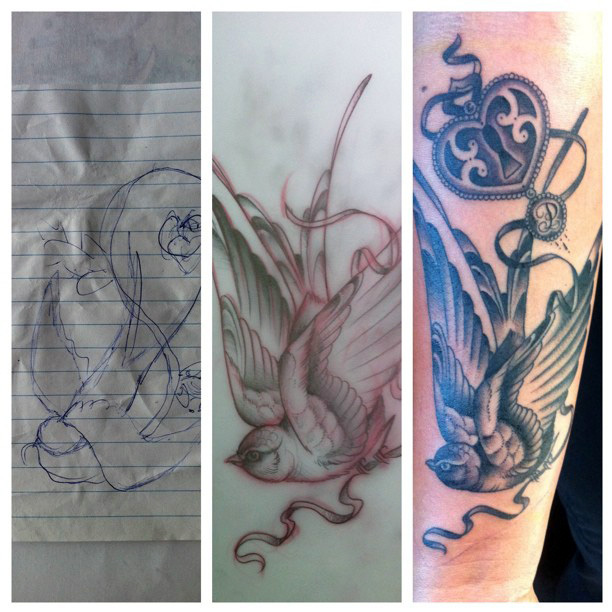 Drawing and research is the part of tattooing that most clients take for granted. It's the part of the process that as a client you don't always get to see (unless the artist you have chosen draws right on the skin). Custom tattooers spend hours drawing on their own time. A small piece might only take a half hour or hour, but a sleeve can take days of redrawing and reworking. This is time we invest because we not only care about the finished product but we care about our business. Generally, we don't charge for this part of the process. We invest the time because we see a return on that investment. When we make a great tattoo we not only make money but we have a walking advertisement for our business. So when someone doesn't show up for an appointment or cancels their appointments consistently we lose income and we don't see a return on the investment of time. The time spent drawing the tattoo for the client doesn't show up we could have spent drawing for a client that would show up. Usually shops require a deposit that goes to the artist in the event of a cancellations but it often doesn't adequately compensate for hours spent drawing and of wages lost when not tattooing. I think because getting a tattoo is often considered recreation for the wearer, the work that goes into preparing one is also considered recreation. Although we love our chosen profession, love doesn't pay the bills, ha-ha. Every tattooer charges differently. Some charge per piece and some charge hourly. Most charge hourly for large-scale pieces as there are too many variables to properly estimate time. These variables include, but are not limited to; the intricacy of the design, the placement (maybe it's an especially painful location, the clients ability to withstand pain plays a role in how fast we can work, or maybe it's a part of the body with difficult skin) etc... So asking how much a sleeve costs is a little like asking a real estate agent how much a house is. We both need specifics to give you a ballpark figure. Cost is definitely something you should discuss before you embark on a project. Sometimes it is worth saving up a little longer to get the tattoo you want rather than cutting corners to make it cheaper. A tattoo is forever, it's worth getting a nice one. The cost of a tattoo varies from city to city and country to country. I would suggest calling shops and seeing what the market rate is where you are. Most reputable shops in a given city tend to charge about the same so if you find a place that charges considerably less I would be suspicious. Take a look at the quality of the work and then decide for yourself. Be on time! Although chances are you will be. I still get excited to get tattooed and look forward to the date as it approaches and I know most of my clients do too. There are a few things you can do to prepare: use moisturizer in the weeks/days before your appointment, come fed and well rested, bring snacks and fluids, wear or bring appropriate clothing for your own comfort and to give the tattooer the best access to the area to be tattooed and bring cash! Ha-ha, I know some shops now take credit and bank cards but most still only accept cash. For my clients the first appointment is when they see their design for the first time. When you see your drawing, this is your chance to voice your opinion and to listen to your artist explain why they have made changes. With my clients if there are minor changes to be made we make them on the spot and if there are major changes we book a new appointment. Don't be shy! The tattoo is for you. Ultimately you wear it, do not worry about hurting our feelings. We draw for you. We want you to be happy. If you don't speak up we cannot be responsible for you not liking something. As in any relationship, communication is key. Guen Douglas: What Do You Want to Talk About?